Ataloa Lodge Museum on the Bacone College campus in Muskogee, Oklahoma had been recommended as a small museum with an interesting collection of Indian art. The liberal arts college of 900 students has about 30 percent Native American students and teaches a number of Indian languages. The school was originally founded in 1888 as a university for Indian students. Housed in an old lodge the museum was established in 1932 and is Native American operated. 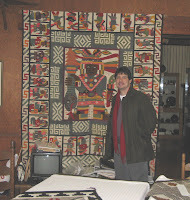 Curator John Timothy at the Ataloa Lodge Museum in Muskogee, Oklahoma, shows off one of the gems of the Indian collection. We were fortunate to get John Timothy as our guide for the morning. John told us he had really lucked out in becoming a curator of art. He was able to meet so many interesting people who visited there. 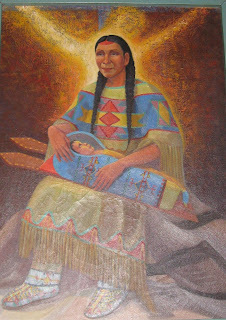 He also taught art, especially Indian bead work, at the college. The lodge is a small venue of only a few rooms, but includes 20,000 pieces of both traditional and contemporary Native American art. The lodge was built of native sandstone by students at the college. The massive fireplace in the lodge is made from stones from all fifty states representing the widespread habitat of Native Americans. 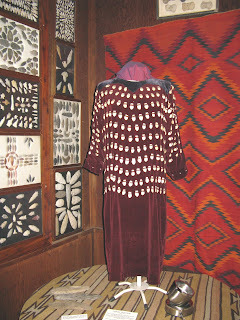 An Indian woman’s dress decorated with precious elk teeth. John, a Creek, pointed out many of the interesting features. I was attracted by an Indian woman’s dress that he said was decorated with elk teeth, a form of ivory that was as precious to them as gold is to us. A painting of a 14th century Italian Madonna and child with Mary and Jesus in 14th century dress seems natural, but a painting of a Creek Madonna and child came as a surprise as did a Creek Jesus on the cross. In the painting the Creeks’ enemies, the Pawnee Indians, are portrayed in the role of the Romans. A large glass case holds 88 Katrina dolls donated by Dr. Julius LaCroix. It is one of the largest collections in the U.S. The only larger collection I have seen is at the Heard Museum in Phoenix. John had highlighted a painting by Jerome Tiger, a fellow Creek, who lived fast, produced great art both in painting and sculpture and died at 26 in a shooting accident. Tiger was very productive and his paintings hang in a variety of the best museums in the Southwest. John said Tiger’s daughter was also a talented artist and had a studio nearby. On John’s advice we visited Tiger Gallery where Dana Tiger met us. Her father died where she was only five. She not only is a productive artist, but her children are moving in the same direction. She said her teen age son, who has already won national art contests, is a natural artist and very spontaneous in his art while she and her daughter have to work at it. The son has had failures; one sculpture collapsed because he didn’t understand underlying structure, but another sculpture won a national award for young people. Her card says, “Honoring the historical dignity and contemporary determination of Native women.” Her paintings of active women place her as a strong feminist. My wife, Carla, was so taken with a painting of four women on charging steeds she bought a signed, numbered print that now hangs above our fireplace. 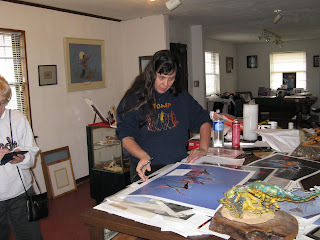 Dana Tiger, a Creek Indian artist, signs one of her prints for a customer. Dana said she worried about making it as an artist and recently when ill decided to go the starving artist route and sell 100 small pictures for $50 a piece. She paints them rapidly and has sold the first 95 and is working on the last few. Her original paintings usually sell for over a thousand dollars. 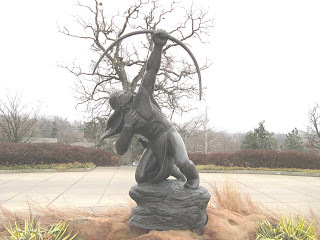 Later in the week at the Gilcrease Museum in Tulsa we discovered a modern Indian artist, Allan Houser, and his sons Philip and Bob Haozous. Their work was in a special display filling four of the central rooms. Houser’s work consisted of a range of sculptures, some very modern in style others more traditional. The walls were lined with paintings of Indian life, some as watercolors. The surprise was that we had been seeing his work for years and hadn’t made the connection that the pieces were done by the same person. His work is in two dozen major museums around the U.S. and we had seen his work in at least eight of them including the United Nations, National Museum of the American Indian, Haskell Institute, and Heard Museum.